For people who are deaf, hard of hearing and/or speech impaired, please use email or the relay option of your choice to contact us. Disability Services, a division of Student Affairs, is committed to providing an equal educational opportunity for all qualified students with disabilities. 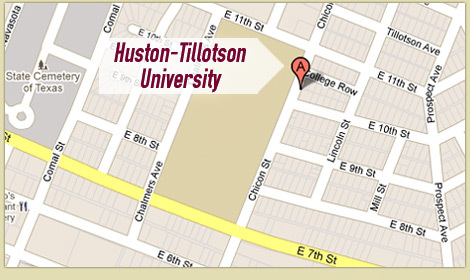 Disability Services is responsible for initiating and coordinating services for students with disabilities at Huston-Tillotson University. has presented appropriate documentation including diagnostic documentation from a licensed clinical professional regarding the disability. Participate in an intake appointment with Disability Services staff. Disability Services staff must review all documentation and determine whether the student is eligible to receive services. Student must register/consent to services with Disability Services to initiate accommodations. Reasonable and appropriate accommodations are determined by the student and the Disability Services staff based on documented needs and functional limitations of the individual. Students are responsible for meeting with their instructors to discuss accommodations and provide them with a letter written by Disability Services staff which will list recommended accommodations. The letter written by Disability Services staff will list recommendations for accommodations. The letter from Disability Services is provided to the instructor by the student. Letters of Accommodation may be re-evaluated with input from the instructor, the student, or additional documentation. The aim is to encourage self-advocacy skills in the individual with a disability and to include the faculty member or supervisor in the accommodations plan. Accommodation letters must be requested, reviewed, and reissued each semester the student expects to receive services. FERPA, HIPPA and all other laws of confidentiality are observed strictly. All individuals seeking services must sign a release of information statement which promotes dialogue among office staff, the student, and the instructor or service provider on a need-to-know basis. NOTE: Because each person’s situation is unique, the office simply asks that any interested student meet with us. Documentation requirements vary by situation. Disability Services staff will talk to the student about documentation during the initial conversation. No student should delay meeting with Disability Services out of concern for not having appropriate paperwork. Documentation of a disability is indented to assist both students and Disability Services staff in assuring that documentation demonstrates a functional impact on one or more major life activities and supports the requested accommodation(s). Accommodations are considered effective after the student completes the Disability Services intake meeting, submits appropriate and complete documentation, and has presented and discussed his/her accommodation letter with instructors or professors (for testing accommodations, the student must notify Disability Services at least 3 days prior to the test to coordinate testing). Accommodations are not retroactive. Important note for those with mobility impairments: If a class, program or staff office is inaccessible to you please contact Disability Services to discuss alternatives and solutions, including but not limited to relocation. HT Emergency Evacuation Information for Students with Disabilities (SWD), including a map of accessible exits and routes from buildings, as well designated meeting places. Note: The text above covers the content of the evacuation map (i.e., accessible exits of buildings and designated meeting places when evacuating). HT has not done its part unless each student situation and request has been individually assessed because how could we know it was reasonable without that assessment.